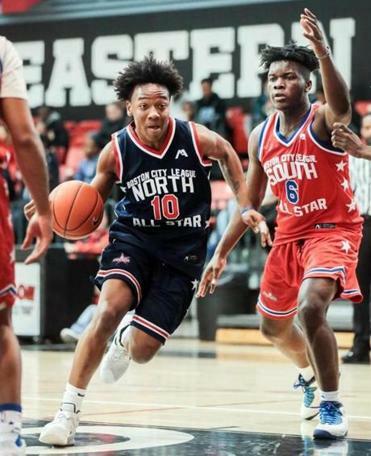 Alexander Delarosa ((10) of the North All-Stars swerves past Franklin Udeh (6) of the South All-Stars in Saturday’s Boston City League all-star game at Northeastern’s Cabot Center. For the basketball players on display at Northeastern University’s Cabot Center, Saturday afternoon was certainly one to remember. Liberated from the pressures of the regular season and MIAA tournament, some of the most gifted athletes — academically and athletically — in the City of Boston put on a show for the fans at the annual Dr. Joseph Warren Memorial Classic. Without their high school coaches in their ears about making the extra pass or slowing down the pace, the players treated everyone in attendance to a variety of long-range threes, fancy dribble moves and high-flying layups and dunks that made fans wish the Cabot Center featured an instant-replay videoboard. Founded in 2009 by Suffolk Construction CEO John Fish, the Scholar Athletes program is a multi-million dollar non-profit initiative intended to address chronic deficiencies in Boston’s school athletics system. For the 3,000 students involved in the initiative, Scholar Athletes boasts a 94% high school graduation rate, and an 85% college acceptance rate. In the two games on the afternoon, the Girls’ South team defeated the Girls’ North team, 51-43, and the Boys’ North team defeated the Boys’ South team, 100-83. Led by Fenway forward Me’Ara Carter (13 points), the Girls’ South squad erased a double-digit second-half deficit to come away with the victory. South head coach Malcolm Andrews, the Tech Boston Academy mentor who this season was named one of the Boston City League coaches of the year, said he was was humbled by the opportunity to represent the City League at such an important event. Andrews added those same peers have been a part of a shift in the culture of Boston city basketball that has had a positive impact on participating players. He said the showcase event was a manifestation of their efforts. The boys’ game featured plenty of athletic theatrics, highlighted by O’Bryant’s Rivaldo Soares’ pair of thunderous first-half dunks that ignited the packed house at the Cabot Center. Charlie and Charles Mitchell, the twin guards from New Mission, combined to pour in 39 points to lead their North team to a 17-point win. North head coach Drew Brock of O’Bryant, who was coaching in his third City League All-Star game, said he wanted to make sure his players had fun on the floor. 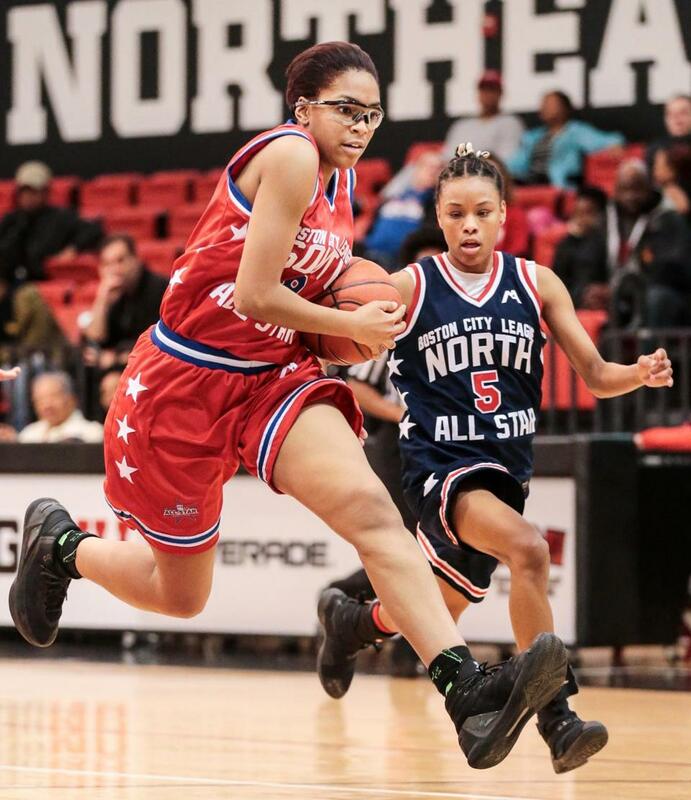 Janyah Gulley (8) of South All-Stars dribbles past Taneja Jones-Drayton (5) in the girls’ Boston City League All-Star game at NU’s Cabot Center.